What I believe we are seeing here is soft alien disclosure. Isn’t it interesting that two unrelated entities, the Vatican and NASA, are both saying nearly the same thing, that alien life does exist, and that it is ok to believe in aliens? Tying all of this together, it seems to be clear that both NASA and the Vatican are preparing Catholics, and indeed, all people of religious faith, to face the inevitable: That aliens exist, and that one day soon we will make contact. I encourage you to research all of this for yourself. A very strong spiritual deception is looming on the horizon. The only way to resist it will be through the Word of God, the Bible, and the power of the Holy Spirit. The Apostle Paul informs us that God will allow this deception to affect almost every person on Earth who refuses to believe in His Son, Jesus Christ (the truth). And for this cause God shall send them strong delusion, that they should believe a lie (2 Thess.2:11). It’s coming folks. Everyday the news media lies, our political leaders lie, and in most cases, our churches are not telling the truth either. Tragically, it seems that we are living in a new Dark Age. The only way to avoid the deception is to pray for discernment. The Lord Jesus will lead you into His truth, in fact, He is the truth–the way, the truth, and the life (John 14:6). 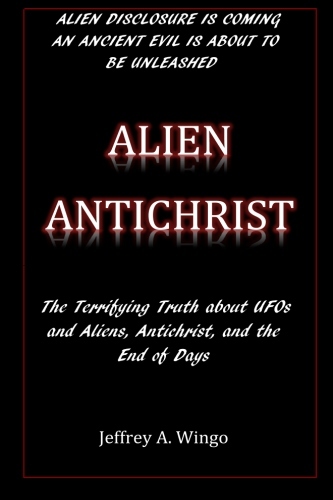 If you would like to learn more about the coming Great Deception, then I would encourage you to get a copy of my book, Alien Antichrist, The Terrifying Truth about UFOs and Aliens, Antichrist, and the End of Days. You can get the book at Amazon and Barnes and Noble, and at other fine bookstores. The only way to spread the message that the Lord has given to me was to write the book. There, the entire study is laid out for you. All you have to do is take the time to read it to learn the truth about what may soon transpire on a massive scale on our planet. My motivation is to disseminate the information to as many people as I can before the prophetic hammer begins to fall. The book reveals that the Antichrist is not a human being but an “alien” king who ruled the world during the days of Noah. In other words, he is a powerful fallen angel currently held in the dark inner chambers of our planet. One day the Dragon (Satan) will be cast out of the heavens and he will release this powerful demonic personality from the abyss. The Antichrist Beast will then go forth “conquering and to conquer”(Rev.6:2). The end result will be the establishment of a worldwide empire called Babylon the Great and this will lead to the Abomination of Desolation and the Great Tribulation. 7. Strong’s G1753 – energeia; G4106 – plane. Thayer calls this a “diabolic influence” (Thayer’s Greek Lexicon).